Down-tempo electronics and trip-hop have been a bit under-exposed on Merchants of Air. Not that we don't appreciate this music, on the contrary. We just rarely receive these releases. When I found out about Monophona, I immediately requested a press-kit and the next morning I found everything I needed in our inbox. For the record, I didn't know about the existence of Monophona yet. They suddenly showed up on my newsfeed because someone posted a track. I didn't even have the chance to listen to the track either since it was late at night. All I saw was the biography and the completely unconnectable musical backgrounds of the band members. That sparked my interest and the next day, I was pretty glad having requested this. 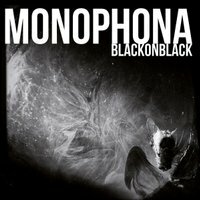 Monophona are Claudine (vocals, guitars, keys), Jorsch (drums and percussion) and Chook (production), all born, raised and residing in Luxembourg. Chook was a DJ and drum & bass producer while Claudine toured as a singer/songwriter in a folk band. When they got together, they decided to take on the challenge of bringing both worlds together. The drum & bass sound impaired and the fragile vocals went through several effects, at least on some occasions. The result has become a very interesting album that could compete with the likes of Tricky or Banks. Electronics and acoustic elements blend perfectly together in ten beautiful songs. The tracks on Black On Black really do sound like electronic folk songs, something I hadn't expected, at least not in this quality. The emphasis still seems to be on songwriting while the electronics succesfully mimic the warm atmosphere of analog instruments. The basslines bring a sense of darkness to the whole album, especially in songs like 'Yes Yes' and in the title track 'Black On Black'. I think the term 'dark dub' is suitable for these. They often remind me of an act like Scorn or Kode9 & Spaceape. Claudine's fragile vocals levitate freely over these sonic bursts, creating something that sounds a little bit out of this world.